The bit marked “History” in my head is a bit of a muddle. It feels full of significant images that get added to, or overridden, or shuffled about somewhat, or coloured in more clearly and accurately. Moreover, the process isn’t a tidy one: the various new phrases, images and facts don’t present themselves in correct time-order. The “new” essential fact or story arrives as a surprise, and suddenly a question I hadn’t known to ask is answered. Please excuse the simplifications but, in my mind, WWII buzzes with images of aerial warfare, partly because of RAF links within my family. I think of fighters and planes and bombing raids and the Blitz raining down on London, where my grandparents had lived, and across the face of Britain. 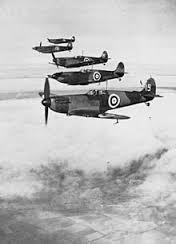 I know WWII is much more: the British soldiers, Dunkirk and the Allies, the Nazi atrocities, the bombing raids, conflict across Europe and the East and so on and so on, but WWII often seems a time when, through the use of aircraft, war arrived here on British soil. 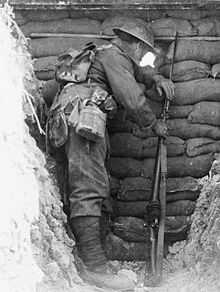 WWI, by contrast, seems as of it is our soldiers over there, shelled and blasted while they waited in the trenches and went over the top in France and Flanders. Yes, there’s more: the industrial-level war, the generation of men that did or did not return, the changing roles of women, the economic seeds laid for further trouble, and so on. 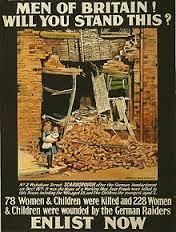 But my first image of WWI are often iconic photos, like that which inspired the final scene in Blackadder. Then, last weekend, I heard a new story. I was visiting Scarborough Castle, a ruined keep whose dominating headland sticks out into the North Sea. 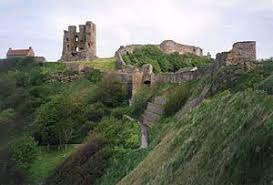 Scarborough Head has been an invaluable look-out point since the Bronze age: the observer can see out across a wide horizon, and watch over the curving beaches that stretch North and South from the foot of the cliffs. Some of the retaining walls remain but the keep itself rises like a shattered hand. It was there, standing by the ruined stones, that I heard the story that changed my perception about the start of WWI. Scarborough with its aquarium, pier and many entertainments was widely considered a place of idle pleasure and recreation. Even the ruined Castle, mostly used as pastureland, was leased by the Town Council, becoming another of visitor attraction and even, in 1912, the venue for an impressive historical pageant. Suddenly, in 1914, Scarborough became famous for a less welcome event. In July, war had been declared. The months that followed seemed peaceful to the population at large, and attention was focused on news from across the Channel. However, at 8am on the morning of 14th December, two German warships, the Vann Tann and the Derfflinger, suddenly appeared out of the mist just off Scarborough Head, with guns aimed at the town. For over thirty minutes, shells hit several buildings, including the Grand Hotel and the barracks within the Castle walls. There were reports of damage, deaths and injury and, fearful of another onslaught, guests and inhabitants crowded Scarborough station, trying to escape. The two warships were part of the great German fleet moving steadily up the North Sea towards Scapa Flow. Sailing northwards, the pair shelled Whitby and Hartlepool, butthe bombardment of Scarborough, a defenceless non-military seaside resort, was what caused the greatest national outcry. Suddenly, the reality of war with Germany had come much closer to home. I can’t help feeling that the attack on Scarborough must have had a similar effect on the national consciousness as the London July bombings. Among the newspaper reports displayed in the Art Gallery is the funeral procession of the one territorial soldier killed in the attack, shown as further evidence of a despicable attack on a civilian population. There was no garrison at the Castle, though the name may have suggested otherwise. The mechanical might of WWI had arrived here, not “over there” and the possibility of further bombardments from the sea must have haunted all those living by the coast throughout the war, and for the following decades. As the news spread, questions were asked in Parliament about the whereabouts of the Royal Naval fleet, which lead to a different, more complicated story and the troubles of Admiral Jellicoe. 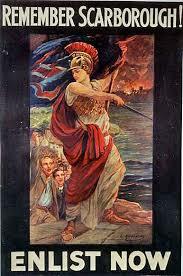 War on British soil, over here, as well as over there. Fascinating post, Penny. As ever, it takes the shock of one specific event, or the injury or death of one individual person, to focus opinion and bring about change. I knew nothing about this - thanks for posting, Penny!